Mohan Bhagwat’s RSS with or without Modi-Shah is planning for a long haul. It is unlikely that a strident and passionate advocate of Indian (Hindu) philosophy, Mohan Bhagwat, would want to learn anything from Mao Zedong. But it was Mao himself who advised his party cadre to “bombard the headquarters” of the Communist Party! Although Bhagwat has not taken such a radical stand, he has indicated (or pretended) that he wants to break from the past that was defined by M.S. Golwalkar and earlier by K.B. Hedgewar. If indeed it is an honest appeal, it could start a “cultural revolution” of sorts within the Sangh Parivar, with Muslims, Dalits and even women making it to the top echelons of the organisation. But, Bhagwat dare not storm the Resham Bagh bastion of the RSS. Or perhaps, he wants to settle for a milder version like that of Pope Francis who initiated dialogue with other cultures and other religions, altering Vatican’s discourse. Whatever his objective, Bhagwat definitely managed to grab the headlines, a few months before the next Lok Sabha elections. There are various shades of responses to Bhagwat’s speeches in the three-day convention titled ‘Future of Bharat: An RSS Perspective’. There are those who have profusely welcomed this “new openness” of the Rashtriya Swayamsevak Sangh (RSS). There are others who feel it is a “cunning, even diabolical” strategy to pretend that the conservative, communal character of the organisation is changing. The “liberal” supporters of the RSS were never really comfortable with the Narendra Modi-Amit Shah slogan of “Congress-Mukt” Bharat. They were seeking a kind of “detente” with the Congress. Bhagwat has perhaps responded to their plea ahead of the elections. A few political observers feel that it is a calculated critique of Modi and Shah. The traditional RSS watchers observe that the “politburo” of the Sangh is preparing for a change of guard after the elections. They expect the BJP to suffer defeat of about 100 seats. In the event of a hung Parliament, with BJP just about emerging as the single largest party, they want someone else to lead the government. Hadn’t they dumped L.K. Advani after 2009? The Communist parties may not like to be compared with the RSS, but structurally, there are some similarities. In the Soviet Union, in the pre-Gorbachev era, the final authority was not president or prime minister, but the general secretary of the party. In the internal meetings of the politburo and central committee, the leader would be chosen by the “high command”. Similarly, the RSS largely decides who should lead the government. But sarsanghachalak himself is chosen by a rather secret group in the RSS, which determines issues and handles leadership questions. Nobody knows how Bhagwat was “elected”, who were the candidates contesting against him, who got how many votes, or who elects the “mandal” (the equivalent of the politburo). Was there any debate about what should be the RSS strategy ahead of his speech? Bhagwat pretended to be distancing himself from the theories of M.S. Golwalkar. Most RSS leaders are brought up on Guru Golwalkar’s Bunch of Thoughts but Bhagwat said some of those thoughts are now outdated. One can only infer or speculate how the old RSS guard must have felt on this observation. 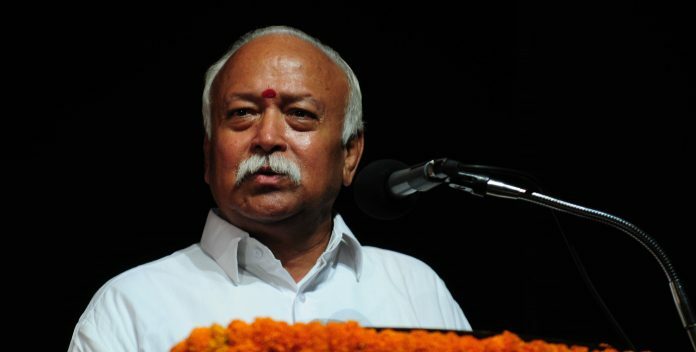 Bhagwat noted that “the day it is said that we don’t want Muslims, it won’t be Hindutva”. But his followers thrive on alleged “Hate Muslim” campaigns. Systematic targeting and lynching of Muslims by cow vigilantes are being reported more and more in the last four years. Even former vice-president Hamid Ansari observed that there was a sense of unease and insecurity among the minorities. Golwalkar and V.D. Savarkar were never in agreement on several issues, except on their hatred for Muslims and Nehrus. In fact, Savarkar has heavily criticised the RSS ideology of Hindutva. The RSS was set up in 1925, while the Hindu Mahasabha (HMS) was established at an all-India level in 1915 (when Savarkar was in jail). Savarkar began to work for the Sabha only after he was released from the jail in 1924. Indeed, in many elections, from 1952 onwards, the HMS had candidates against the Jan Sangh and even against the BJP (which are political affiliates of the RSS). The Janata Party disintegrated precisely on the issue of ideology. The Jan Sangh MPs refused to give up their association with the RSS. Other parties in the Janata coalition argued that there cannot be dual membership and dual ideologies. They said the Jan Sangh must give up the ideology of Hindu Rashtra and membership of the RSS. The Jan Sangh members under the leadership of Atal Bihari Vajpayee and Advani said the RSS was like their mentor and parental organisation. So, their loyalty to the RSS was unquestionable. The RSS always maintained that its ideology was centred on “cultural nationalism” and it did not engage in politics. However, it has always been accused of wielding the government’s “remote control”. On the other hand, the Hindu Mahasabha has always been an upfront political party. It did not wear the mask of being a cultural or a social front. Savarkar’s HMS did not mind cow slaughter, consuming beef or non-vegetarian food. The HMS never built a cadre-based organisation. The RSS, in contrast, created a nationwide network of cadre. It was a few years after Savarkar’s death in 1966 that the RSS began to hobnob with the HMS. Now, the BJP campaigns as if its Hindutva is defined by Savarkar. (It is like CPM saying that their ideologue is Leon Trotsky!). Since most people even in the BJP are ignorant about the ideological issues, they don’t care about these details. So they would neither learn, nor unlearn anything from Bhagwat’s new ‘Bouquet of Thoughts’ replacing Golwalkar’s Bunch of Thoughts. Clearly, there is a system and strategy that RSS has adopted. Invite former president Pranab Mukherjee to Nagpur and gauge the response, and then even invite Rahul Gandhi to show the “liberal” mukhauta. The RSS with or without Modi-Shah is planning for a long haul. They want to have a “win-win” situation after the 2019 elections. So, Bhagwat takes a stand of welcoming Muslims, and Shah says there would be deportation of “illegal migrants”, which is a code for Muslims. Amit Shah has said that the BJP would rule for the next 50 years. Bhagwat is preparing a blueprint for it. In a young nation, where about two thirds of the population is below thirty years of age, ruling for fifty years is a rhetorical flourish. It would mean relying on the voting preferences of the unborn whose parents are still in diapers.